Enter through the 'Poor Door': Income 'segregation' in N.Y. This building on New York's Upper West Side will have a separate entrance for low-income residents. It's a tale of two cities in Manhattan, as the city okayed plans for a luxury condominium with a separate door for low-income residents. The 33-story complex will have 219 expensive condos for sale and 55 to rent cheap to low-income tenants. This building's approved "poor door" is new, but the issue isn't. There are a number of similar buildings across the city that restrict some residents from fancy amenities -- think gyms, playrooms and rooftops. The plans for the latest development at 40 Riverside on Manhattan's Riverside Drive were approved as part of the Inclusionary Housing Program, an effort to mitigate inequality by offering affordable housing in nice areas. The program, enacted in 2009 under former New York City Mayor Michael Bloomberg, gives developers tax breaks and more space in exchange for building affordable housing either in the building itself or close by. Until 2009, when you had moderate and affordable housing in the same complex, both projects had to be integrated. But the change allows developers to create a building within a building, with separate entrances, elevators and electrical wiring. In theory, the Inclusionary Housing Program gives families who couldn't afford to live in the city an opportunity to live in good school districts and new buildings. But in practice, advocates say it's leading to a new kind of separate but equal. "It's treating low- and moderate-income tenants like second-class citizens. It's de facto segregation," said Public Advocate Leitia James, who has filed a human rights complaint against developers who try to limit access to building amenities. She said that she has seen a number of buildings exclude low-income tenants in different ways. James filed a complaint on behalf of residents of Stonehenge Village, another complex on the Upper West side managed by Stonehenge Partners, which built a new gym that would only be available to market-rate tenants. Stonehenge Partners did not respond to requests for comment. Other developers have also come under fire for similar practices. Another Upper West Side building, the Windermere, allegedly kept affordable-housing residents away from the once-public roof and playroom, according to The New York Daily News. The Windmere's management company Stellar Management did not respond to requests for comment. It's not a situation unique to Manhattan. Residents at Northside Piers in Brooklyn are separated into two separate buildings. The buildings have completely separate entrances and rental residents are not permitted to use the amenities in condo buildings. David von Spreckelsen, president of Toll Brothers City Living Division which developed Northside Piers, said the buildings operate on two completely different systems, not because of income level but because they keep owners and renters separate. Mayor Bill de Blasio's office said while it's too late to do anything about 40 Riverside, since 6-stories were already built by the time he walked into City Hall, his administration is committed to changing the zoning code. "The previous administration changed the law to enable this kind of development," said Wiley Norvell, City Hall spokesperson. "We fundamentally disagree with that approach...and want to make sure future affordable housing projects treat all families equitably." 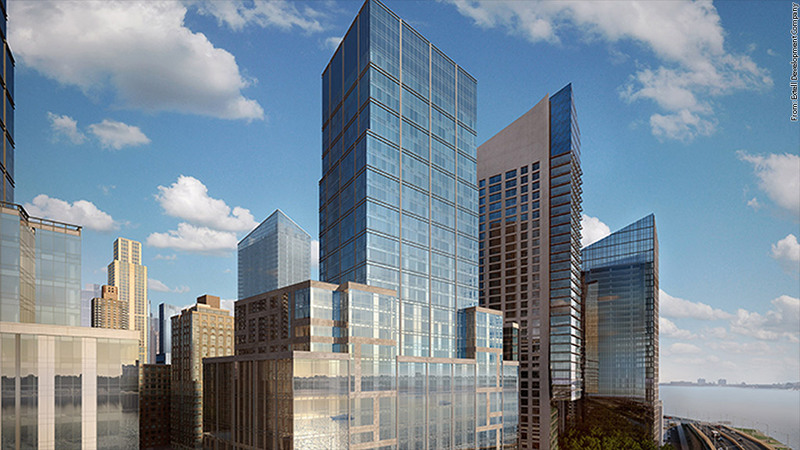 40 Riverside's developer, Extell Development, did not return requests for comment.